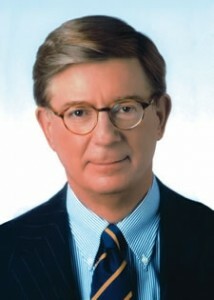 George Will is probably best known as a Pulitzer-winning conservative political columnist for publications such as The Washington Post and Newsweek. He’s also a lifelong baseball fan, the author of two books on the game (“Bunts” and “Men at Work”), and a die-hard supporter of the Chicago Cubs. From his office in Washington, Will spoke with The Heckler about his favorite team, the disappointment of the past few seasons, and experiencing baseball in the nation’s capitol. The Heckler: You’ve said before that when you were growing up in Champaign, most of your friends were Cardinals fans. What made you choose the Cubs instead? George Will: I didn’t like the Cardinals broadcaster, a guy named Harry Caray (laughs), believe it or not. That was one reason. And I just somehow turned north instead of south in my inclinations. TH: But you eventually came around on Harry? GW: I did – once he became one of us. TH: Since moving to Washington, how often do you generally get back to Chicago to see the Cubs? GW: A couple times a year. I went back for the Red Sox series earlier this year, and I may go back for a Cardinals series later this year – although it’s not going to be as important a series as I’d hoped. TH: What’s your ideal Wrigley experience? Where are you sitting? Do you keep score? GW: Behind home plate, behind the screen. I don’t generally keep score at games, though I sometimes do at Wrigley Field because the scoreboard, being antique, doesn’t give you as much information. Now that you’re in ballparks where they tell you what the batter did in the previous at-bat and the pitch count for both pitchers, there’s a lot less incentive to keep score. TH: Of all the games you’ve witnessed there, which was most memorable? TH: For you, was that more painful than 1969 or 1984? GW: It was worse. Just five outs away from the World Series. The luckiest man in the world was the Cubs shortstop [Alex Gonzalez], because if Bartman hadn’t touched that ball, everybody would be talking about the double-play ball that he muffed. TH: Going into this season, how optimistic were you about the team and the way it was constructed? GW: I was pretty optimistic – too optimistic. Injuries didn’t help, but the fundamentals haven’t helped either. I was at the game in Philadelphia where, on three different ground balls to Derek Lee, the pitcher didn’t cover first base. Two nights later at Shea Stadium, with a Mets runner on first and a normal fly ball to just medium center field, the man tags up and goes to second. Because we had Macias, an infielder, playing center field – and he was replacing another infielder playing center in Hairston. You pay a price for these things. TH: What do you think about the job Dusty Baker’s done over the past three seasons? GW: It’s hard to separate what he’s done as a game manager, what he’s done getting the team ready to play and what he’s done in helping the rest of the Cubs executives assemble the team. Because there have been so many injuries. Let’s have Wood, Prior and Garciaparra – if he’s still around – healthy for a while and see what happens. TH: Have expectations the last two seasons been realistic, or too high because of the 2003 run? GW: I don’t think they were too high. In 2003, that was a good team. Now in 2004, the Cubs were an embarrassment – the unprofessional behavior of a number of the players, costing them arguments with the umpires, losing their composure on the field. TH: This season, you’ve finally gotten to see the Cubs play in Washington. How would you describe the atmosphere at a Nationals game? GW: It’s very good. The town’s quite taken with the Nationals and taken with Frank Robinson. Nothing please in sports like an overachieving team, and so far the Nationals have been that. TH: Do you have a sense of the Nationals fan base? Is it supporters of other teams, fans who just want to see baseball, or devoted Nationals fans? GW: It’s mostly Nationals fans – a sea of red T-shirts and red hats. With Washington being full of people from somewhere else, there’s always a contingent there for whatever the visiting team is. But it’s a surprisingly partisan crowd overall. TH: Aside from it giving the Cubs a shot this year, do you generally like the concept of the wild card? GW: The wild card is one of the best things baseball has done in the last fifty years. It has helped baseball take September back from college and professional football. Because of the wild card, when you get to Labor Day you’re often going to have a majority of the teams still realistically in contention to play in October. TH: Do you also like the idea of interleague play? GW: I do. The fans like it, and they get a chance to see some players they otherwise probably would never see in person. TH: I also wanted to ask you about the Emil Verban Society [a bipartisan group of prominent politicos who root for the Cubs]. How did you first get involved in that? GW: A man named Bruce Ladd, who was the guiding spirit of it, said to join up. So I did. I don’t think we have the meetings anymore, I think we’re sort of inactive – at least in Washington. But it was just a chance, usually in the offseason, to get together and warm ourselves around the hot stove league. TH: Did you get to hear the Ryne Sandberg Hall of Fame speech? What did you think of it? GW: I didn’t hear it, but I read it. I thought it was quite good. Nothing improves a speech like having a strong opinion that you want to say. TH: Over the years, who have been your favorite Cubs players, past and present? GW: Obviously, Ernie Banks was a great favorite of mine. And Don Kessinger, so the two of them. As for the current team, Derek Lee’s obviously a superb player, so I’d just go with Lee. TH: Do you consider yourself a fan of other sports, or primarily just baseball? GW: I follow them, sure. I’m a season ticket holder to the Caps, the Wizards and the Redskins, but baseball’s my passion. It’s better. It’s just a superior sport in every way.